Musicians at the start of the twentieth century weren’t just having to learn how to deal with the new recording technologies, they were also called upon to help publicise their discs. They appear to have taken to the PR side of things with varying degrees of enthusiasm and success. This is the first of a series of publicity shots from the early years of the recording business that our friends at the EMI Archive Trust have made available to us. This first act up are Gluck & Homer. Two ladies. They were both successful classical soloists (one Rumanian, one American) who joined together to sing sombrous old religious songs. Despite this, the pair enjoyed success on both sides of the Atlantic in the 1910’s. Louise Homer, seated, was the American. She appears to be holding several dead foxes in her lap as she pretends to listen to the latest sounds from the rounds and her displeasure in the experience is clear from her stony faced demeanour. Louise was once described as “having the world’s most beautiful voice” by Nellie Melba herself. She would seem to be wondering how that had led her to this dreadful situation. Her partner, Alma Gluck, is a PR natural. She is throwing herself into the pretend listening experience. Eyes closed, Alma is clearly lost in music but she was caught in no trap, though, because Ms Gluck tasted much success in a career which crossed over from the classics to the mainstream. Her 1916 recording of “Carry Me Back to Old Virginny” for the Victor Talking Machine Company was the first celebrity recording by a classical musician to sell one million copies. We’ve decided to award marks for publicity posing to each of the photos in this series. Ms Gluck is awarded 5/10 for trying. Ms Homer rather lets the side down. She scrapes a sour faced lemon sucking 2/10. That’s an average 3.5/10 for Gluck & Homer. Tune in soon for more in this fascinating series. There is a website that reviews whiskies and matches them to appropriate music to drink along to. The game Ms Gluck’s singing is considered suitable to smooth the palette for a drop of Arran whisky. This might not have been a prudent selection as Ms Gluck sadly died from cirrhosis of the liver. Perhaps unsurprisingly Ms Homer has yet to be chosen to accompany a tipple on the site. 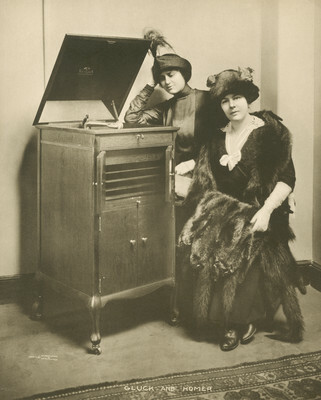 This entry was posted in 1915, HISTORY OF RECORDED MUSIC and tagged alma gluck, emi group archive trust, louise homer, nellie melba, victor talking machine company by Nipper. Bookmark the permalink.